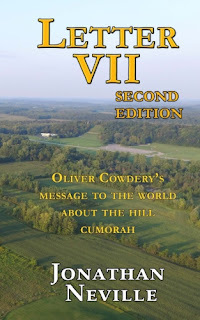 The LDS scholars and educators who try to discredit Letter VII because Oliver wasn't qualified to write it generally base their position on the premise that Oliver never "claimed revelation" about the Hill Cumorah. The obvious response is, why would Oliver claim revelation when he had personally visited Mormon's depository of records, right there in the hill Cumorah in New York? On April 19, 1834, Joseph gave Oliver a special blessing related to writing and publishing. Brothers Joseph, Sidney, and Zebedee then laid hands upon bro. Oliver, and confirmed upon him the blessings of wisdom and understanding sufficient for his station; that he be qualified to assist brother Sidney in arranging the church covenants which are to be soon published; and to have intelligence in all things to do the work of printing. Aside from all his other qualifications, this blessing from Joseph Smith tells us that Oliver had "the blessings of wisdom and understanding" he needed to write the eight historical letters, including Letter VII. There are also some who oppose Letter VII who say that Joseph didn't really help Oliver write the letters. Here's one reason to think Joseph and Oliver worked together. On August 17, 1835, the Presidency of the Church met to examine and approve the book of commandments and covenants, which had been compiled and written by the committee. This took place when Oliver was still writing and publishing the letters. , seconded & voted into this office, by the whole body of the church then assembled. The names of the Committe are as follows Joseph Smith Junr. Joseph and Oliver worked on this committee to "compile and write" the revelations. It seems strange to argue that they did not also work together on the historical letters that Oliver was publishing in the same time frame.